Block 6 is called Circle of Squares. It looks way more complicated than it really is, as you assemble 2 easy sub-block designs and then sew it together like a nine-patch. Easy! In my dreams, when this quilt is finished, I'll be able to have Denyse Schmidt herself sign part of my quilt. This block, with it's big empty white square in the middle would be a perfect spot wouldn't it? Hey, Denyse! If you're reading this...Call me! 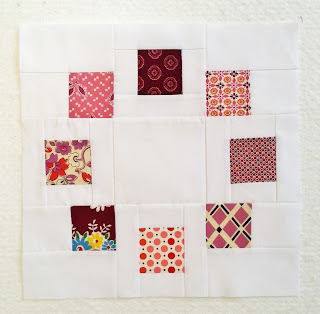 Changes: Instead of using 4 - 2.5" squares to make the corner sub-block design, I cut a white rectangle 2.5" by 4.5". I think it gives it a cleaner look. great block! I love the simplicity of the look. This would be another fun way to get rid of scraps that I still don't have time for. Cool block! Hope Denyse calls you. Do you want to come in Nov. to the sewing summit here? She'll probably be there. What a gorgeous block, I think it would make some fab cushion covers.